Fuse Design is a graphic and web design firm located in the U.K. Fuse uses a simplistic design with a minimal amount of content to describe their services particularly on their home page. The main navigation down the left side is not particularly noticeable as it is small and the user’s eye does not naturally go to that area of the page, especially with the motion graphics that are taking place in the main content area of the page. Because the site is so minimalistic, perhaps it gets away with the placement and size of the navigation because there isn’t much else on the page to distract the user from the task at hand. BDA, Inc. is a global company that helps organizations showcase their brand on merchandise (i.e. mugs, shirts, etc.). The site colors (black background with lime green graphics and white text) sets off the Flash animation that tells the user about the company. The navigation across the top is clear and obvious for the user to find their way to the various sections of the site. A content heavy site, the design segments the content in a logical manner that keeps the user from being overwhelmed by the volume of content. The Flash animation is a creative way to draw the user in, although it precludes the site from being viewed from prominent mobile devices. Foodz clearly identifies their brand with a fairly large logo in the top left corner of the site which clearly lets the user know what the site is all about. The main menu makes it clear how the site is set up for the user to navigate through, and social media icons located in the top right make it obvious to the user that there are other mediums in which to get information about the company. Beyond the links to social sites, Foodz Catering’s website is basically a digital brochure in which the user can navigate through multiple pages of static information about the site. It uses professional photography to showcase their work and the types of events they cater. Jody is a 38-year-old business owner specializing in charity events involving silent auctions and galas with ‘live’ entertainment. Jody hires professional services companies for high-end events she publicizes through social media and dedicated web pages. Jody also provides guests with branded merchandise featured in their gift bags. In order to accomplish these tasks, Jody visits three different websites – Foodz Catering for sit-down dinners, Fuse Design to develop digital web pages, and BDA Inc. for merchandise branding for guests’ gift bags. Swift response times are necessary for demanding non-profit organizations often as disorganized as they are eager. Jody’s first goal is to hire those companies whose sites are easiest to navigate and fully comprehend. Reputation is at a premium, so credible recommendations appearing in accessible places are critical. Loyalty trumps locality and, as a perfectionist, Jody appreciates and notices passion and high quality work. After determining that Fuse does, indeed, do website design, Jody decides to go further. Jody is encouraged to see work performed for another event planning company. The work done is impressive, so Jody decides to continue on. Jody is disappointed that other than the logos for their various clients, Fuse’s client page provides no links to the work done for said clients. Jody is further discouraged by the fact Fuse is located in the UK. She decides to look for another web design firm. Jody clicks on the Flash animation that is front and center on the home page. She likes the creativity shown as she thumbs through the virtual book describing the company’s services. Also part of the Flash animation, a video shows samples of the merchandise BDA brands and decides they are the perfect company for what she is looking for. Being a communication specialist, Jody likes to speak with people personally. She notices there is not a way to order services online, so she finds the Customer Service section of the site to find out about ordering. After reading about the company’s call center, she decides to contact a customer service representative for more information about ordering. Jody notices the corporate headquarters is located in Redmond, WA and uses the phone number provided to get information about ordering merchandise. Foodz Catering: This is a fancy event and it needs spectacular food. 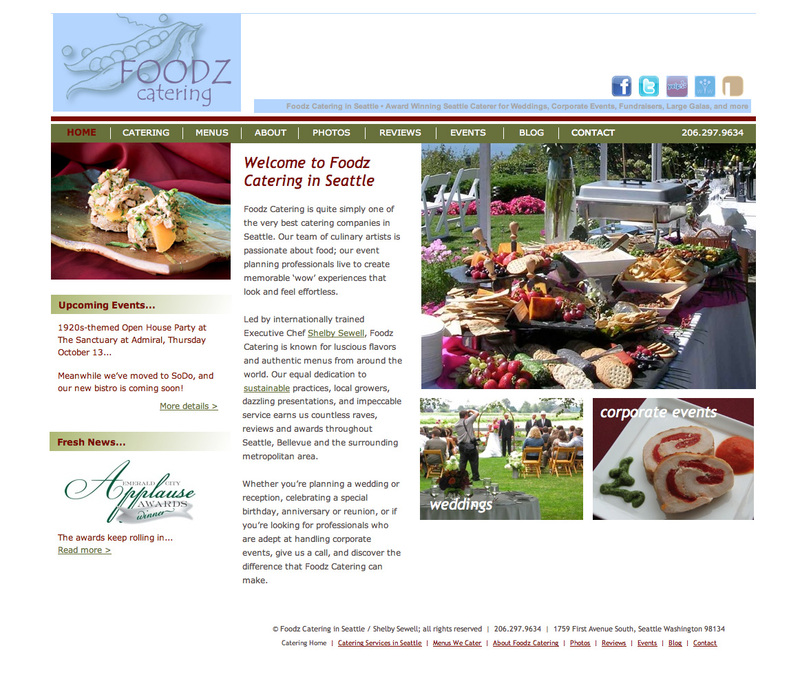 Foodz Catering was recommended to Jody, so she went to their site to see if they could handle her event. Jody feels this is the perfect menu for her event. Jody wants to make sure Foodz has plenty of experience with catering fundraisers. She is happy to see they are. Jody would like to see what others have to say about Foodz. She discovers the “Reviews” page is really a controlled testimonials page with nothing but positive comments. Unfazed, she decides she will have to check off site to find unbiased customer reviews. Jody decides she’d like to contact Foodz and at least set up an in person meeting and perhaps sample some of their offerings. She finds a phone number and makes the call. Nicely done, guys. In a perfect world, we use the same scenario with each site. It’s the only way to compare effectiveness. Three unique use cases.